The Cheyennes, Arapahos, Crows, Blackfoot, and Sioux are among the many tribes of the Great Plains of North America. 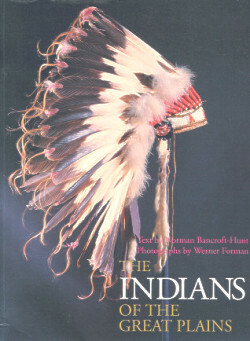 Through Norman Bancroft-Hunt's evocative description and Werner Forman's spectacular photography, this volume presents a vivid image of the lives of the Plains Indians. Historically, the Great Plains tribes depended for food, shelter, and clothing on the buffalo, which thrived on the hardy grasses that are plentiful in the Plains region. Pursuit of buffalo herds required a nomadic life-style, but the Indians' lives were nonetheless highly structured. According to Indian belief, potent metaphysical forces govern every aspect of life. The Indians sought to live in harmony with nature, in which these forces were manifested, and performed rituals to gain spiritual power. Warfare was another defining element of Plains Indian societies, as warriors proved personal worth, defended resources and territory, and established tribal identity through conflict. This magnificently illustrated book with 112 color photographs presents some of the most remarkable civilizations of all time, the American Indians who made their home amid the extraordinary beauty of the Great Plains. Norman Bancroft-Hunt is an artist and a recognized authority on the material culture of North American Indians. He is the author of People of the Totem, a widely acclaimed book on the Indians of the Pacific Northwest. Werner Forman, an award-winning photographer, is internationally regarded as an authority on ancient civilizations.